The late, great Frank Wess (right) with Scott Robinson in 2012. We’ve lost the great Frank Wess – known to many as “Magic” – a dear mentor, friend, and giant of music. Someone I have looked up to my entire musical life. A source of immeasurable inspiration and guidance, as well as friendship. An American treasure. Frank’s was a very good life. He leaves us a stunning legacy of music, played with all the greats. He is best known for his great work with Count Basie, but Frank’s roots ran deep: he knew Jelly Roll Morton, and even appeared in a film with Louis Armstrong! Frank was an extremely colorful character – a true original – and stories of his wry comments are legendary. He performed nearly to the end, and had jam sessions at his home. Sometimes I’d be at a gig playing and would look up, and there would be Frank with his beloved Sara. He was very supportive of other musicians and would frequently come out to hear us, sometimes bringing his horn and sitting in. For me, this is a very personal loss. I worked closely with Frank on many concerts, tours and recordings, and we even started a band together back in the early 90s. I was stunned when he said to me, “We should start a band: you and me on saxophones, with three brass and rhythm. You write some of the music, and I’ll write some.” This octet – later expanded to a nonet when Frank’s eyesight became too poor for him to read his parts anymore – made several CDs, and played many times at Dizzy’s Club and elsewhere. I’m still amazed and mystified that Frank handed me this opportunity. Frank was a personal friend as well as a colleague. My wife and I host an annual cookout/jam session at our home in New Jersey, and Frank almost always attended, rain or shine (frequently rain!) One time it was raining, and people were fussing about Frank getting wet. He waved everyone aside impatiently. “This is summer rain. A little summer rain never hurt nobody!” Frank was no-nonsense all the way. Below, you can see a photo Maria took of Frank at last year’s event, sitting under our giant oak tree with me and the “echo cornet.” He got a big kick out of this antique double-belled horn. 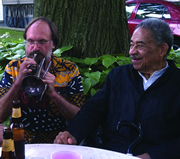 I am incredibly grateful for the time I have known Frank Wess, and for all that he has given me. In recent years when I asked Frank how he was doing, he’d always say “I’m still here.” Hard to believe it, but now he’s not. I will miss him more than I can say.